Copyright � 2003 American Chemical Society. Effective DNA separations in microelectrophoretic systems are complicated by the need to passivate the surface dynamically or covalently. 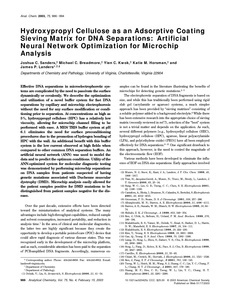 We describe the optimization and utilization of a novel buffer system for fast DNA separations by capillary and microchip electrophoresis without the need for any surface modification or conditioning prior to separation. At concentrations as high as 5%, hydroxypropyl cellulose (HPC) has a relatively low viscosity, allowing for microchip channel filling to be performed with ease. A MES/TRIS buffer system at pH 6.1 eliminates the need for surface preconditioning procedures due to the promotion of hydrogen bonding of HPC with the wall. An additional benefit with this buffer system is the low current observed at high fields when compared to other common DNA separation buffers. An artificial neural network (ANN) was used to model the data and to predict the optimum conditions. Utility of the ANN-optimized system for molecular diagnostic testing was demonstrated by performing microchip separations on DNA samples from patients suspected of having genetic mutations associated with Duchenne muscular dystrophy (DMD). Microchip analysis easily allowed for the patient samples positive for DMD mutations to be distinguished from patient samples negative for the disease.